Ford says the Transit Connect EV is ideal for fleet customers. Ford Motor Co. has taken the first European order for 20 of its Ford Transit Connect electric vans from the Norwegian postal service. The Ford Transit Connect EV is based on Ford's Transit Connect commercial van and is the first product in Ford's global electrified vehicle plan and the first of five electrified vehicles that Ford plans to launch in Europe by 2013. 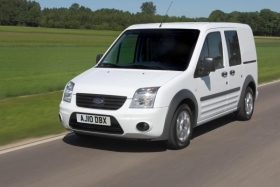 Sales of the Transit EV will begin this summer, to be followed by the Ford Focus EV in 2012. The C-MAX Hybrid and C-MAX Energi plug-in hybrid, will be offered in 2013, together with another hybrid model. The Transit Connect EV began shipping in the U.S. in December. "Transit Connect Electric exemplifies how we are leveraging our relationships as well as our hybrid and advanced powertrain programs to bring energy-efficient technologies from the laboratory to the street," said Derrick Kuzak, vice president of global product development, said in a statement. "Not only is this an ideal vehicle for eco-conscious fleet operators, it is an important part of Ford's future," he said. The vehicle is fitted with an electric ForceDrive powertrain from the Detroit-based company Azure Dynamics Corp., which announced last week that it was opening a European headquarters in London to help support marketing and sales efforts for the Transit EV. The zero-emission van has a range of up to 130km (about 80 miles) on a full battery charge and has a top speed of 120 kph (75 mph).